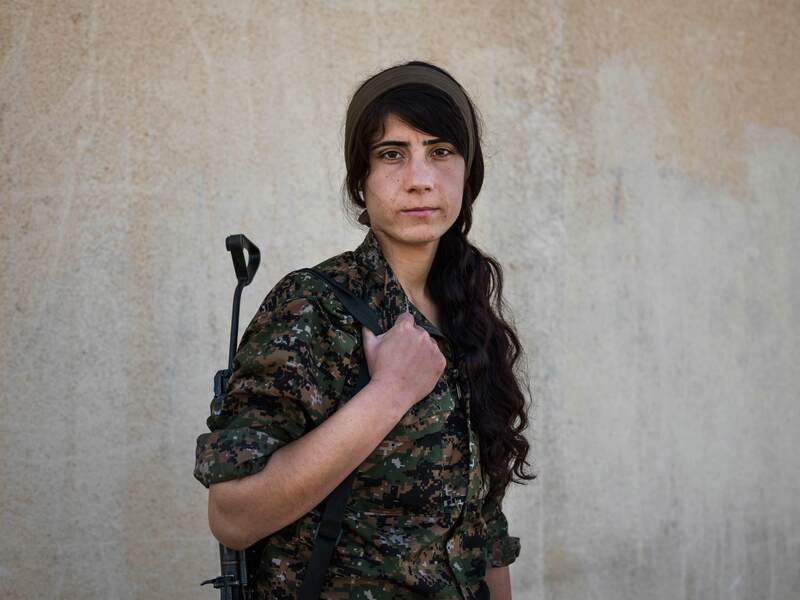 What’s driving young Kurdish women to take up arms against ISIS? Iraqi pro-government forces are making gains in the start of their large-scale operation to retake Mosul, the last major stronghold of the so-called Islamic State In eastern Syria. Fighting alongside the government forces are a Kurdish feminist army, but what’s driving young Kurdish women to take up arms, knowing they may never return? Magnum photographer Newsha Tavakolian went to find out for Huck's Defiance Issue. A dusty pick-up truck drives along the road that passes through Serikani, leading to Al Qamishli, a once sleepy provincial town in eastern Syria. Its only cargo is an unfolded colourful scarf, casually thrown on the front seat. The truck passes by dozens of roadside billboards showing images of young female martyrs. “Without you there would be no us,” reads one. 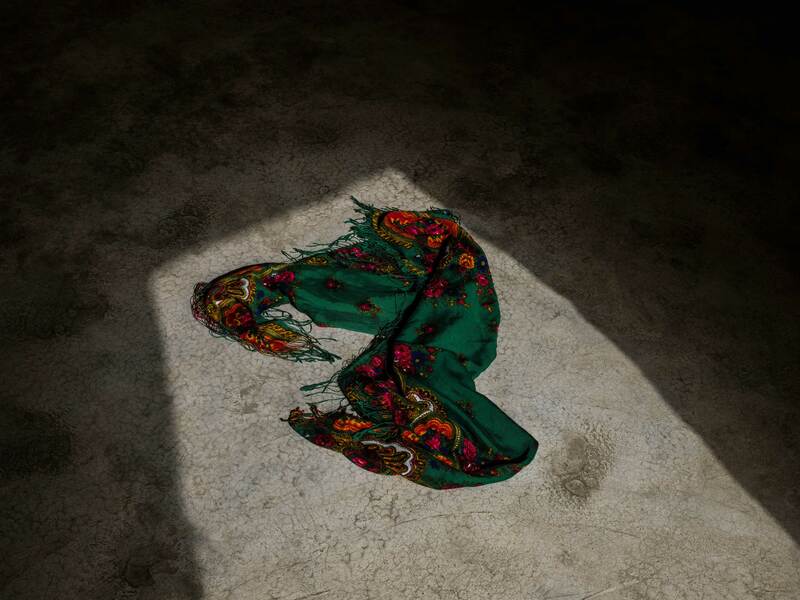 The scarf is all that remains of Cicek Derek, one of thousands of young female fighters who stand at the forefront of the battle against the Islamic State. Cicek, only seventeen, died fighting in Kobane some months ago. With her braided hair, military fatigues and courage to take on violent Islamic militants, women like her have become heroes in the West. 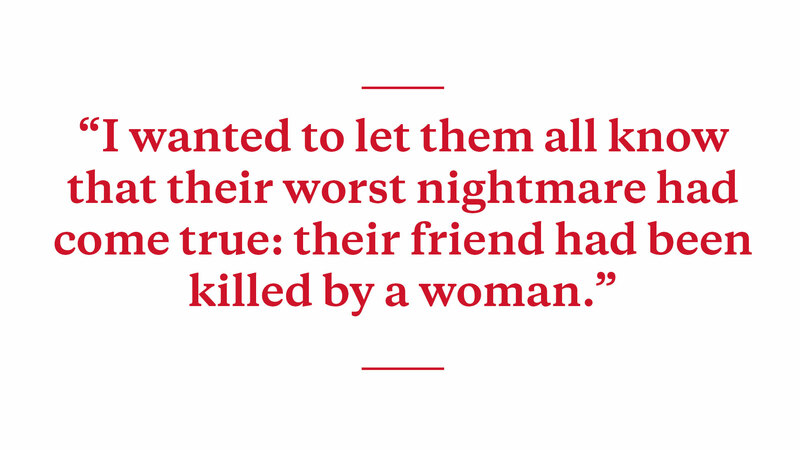 But it wasn’t just the fight with the Islamic State that brought Cicek to the frontlines. Destined to become a farmer’s wife she, like many other Kurdish girls in this dirt-poor corner of Syria, was lured into battle by a powerful ideology promising not only a free Kurdistan – a region and diaspora straddling parts of Turkey, Syria, Iraq and Iran – but also gender equality and an end to the oppression of women. Their leader is Abdullah Öcalan, head of the Kurdistan Workers’ Party (PKK), which has waged a war for Kurdish independence against Turkey since 1984, using armed forces in Iran, Iraq and Syria. And while Öcalan has been in a Turkish maximum security prison since 1999 – with the PKK labelled a terrorist organisation by some organisations and states, though notably not by the UN – thousands of his followers continue to be trained and schooled by his ideas. But what really distinguishes his principles from those of other groups in the Middle East is his carefully planned empowerment of women. It is this lure of a new life that, since 2012, has attracted an estimated 15,000 women to join two offshoots of the Kurdistan Workers’ Party – the YPJ (Women’s Defence Unit) or the YPG (People’s Defence Forces). After the 2011 revolt, when Syrians demanded freedom from Assad’s dictatorship, Kurdish groups like these took an independent stance believing that neither the opposition or the regime would reinstate their rights. 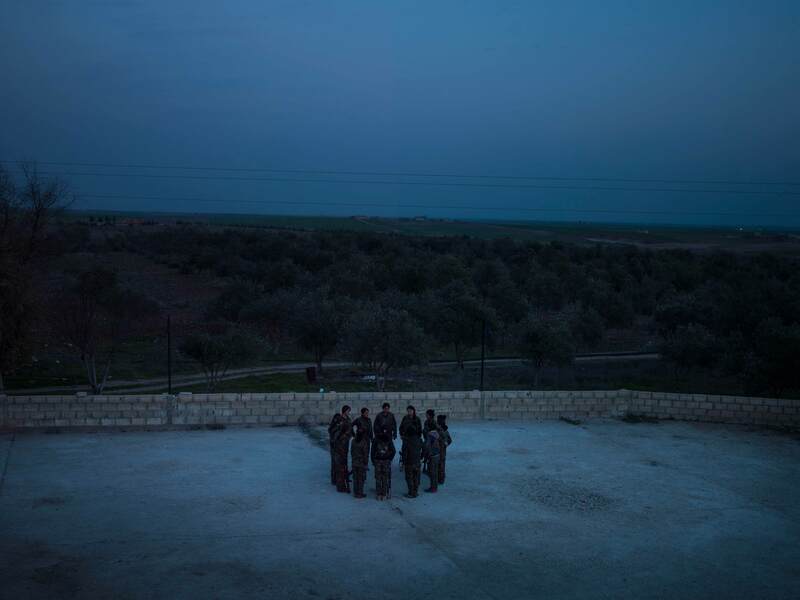 A group of around twenty women in green overalls, who have just gotten back from the frontline in Kobane, are playing volleyball on the top of a green hill. Most of the girls, all members of the YPJ, are either in their teens or early twenties. Their faces are fresh and youthful, but their cold-stricken hands are not those of normal teenagers. The truck carrying the scarf passes through one of several checkpoints controlled by women fighters. 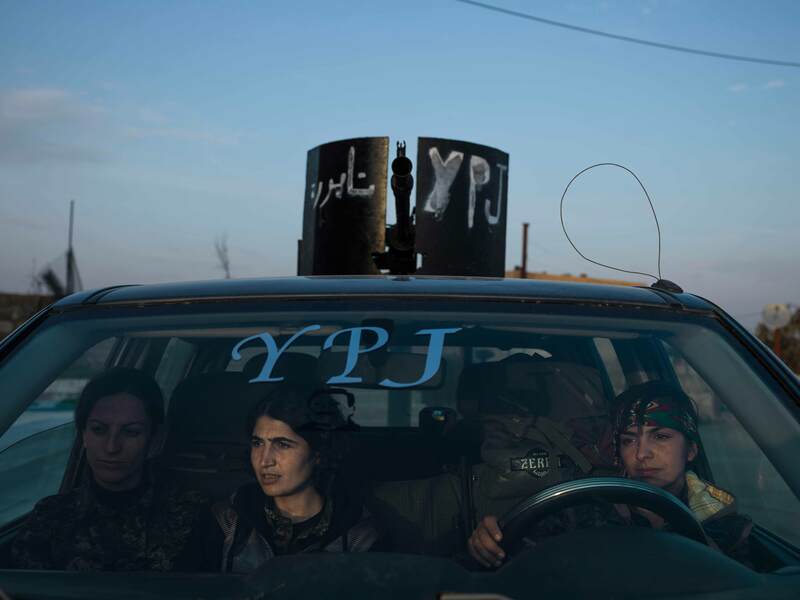 As soon as they notice the YPJ sign on the windshield, they allow the driver to pass without asking for his identification papers. The driver waves his hand as a sign of gratitude and keeps moving. 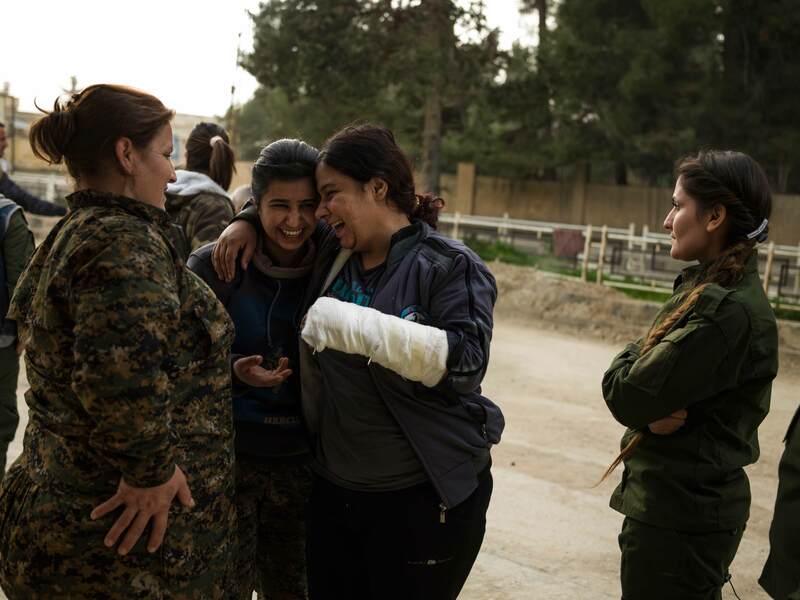 All the girls at Martyr Peyman’s Base – as named after deceased fighter Viyan Peyman – joined the unit shortly after a now famous uprising in 2012, the Rojava Revolution, which not only led the Kurds to take matters into their own hands but also brought Syria’s civil war to their hometowns. 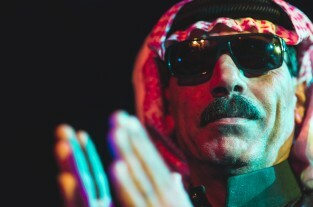 In January 2014, Kurdish groups, overseen by the Kurdish-run Democratic Union Party (PYD), declared autonomy over the Rojava region, abolishing the Assad government’s restrictions on women’s freedom – and cultural and religious expression – with a new constitution and grassroots democratic system. 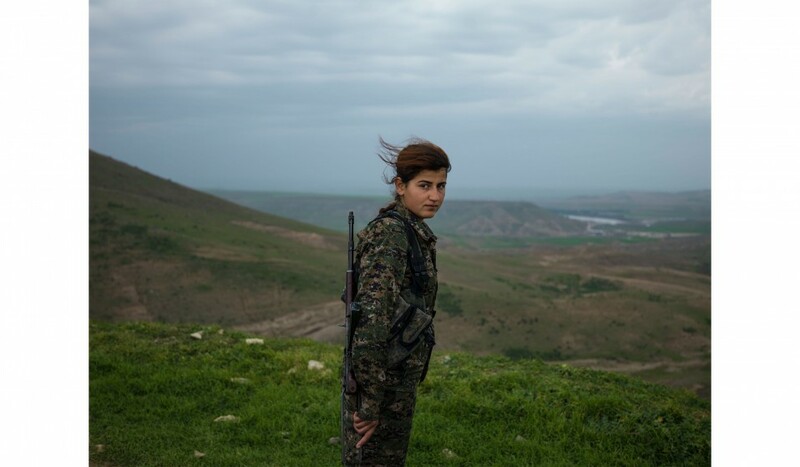 Before joining the movement and turning into warriors, these young Kurdish fighters lived a typical rural life overshadowed by the Assad government and a masculine dominance in their communities. While the government prohibited them from having Kurdish names, or speaking Kurdish in public, at home they were told that politics “was no girl’s business”. It was the return of the first bodies of female martyrs, killed by the Islamic State, that drew many young Kurdish girls towards Öcalan’s ideas. Watching the burial of female fighters, while sitting at home with their parents and siblings, triggered a reaction that would change their lives forever. 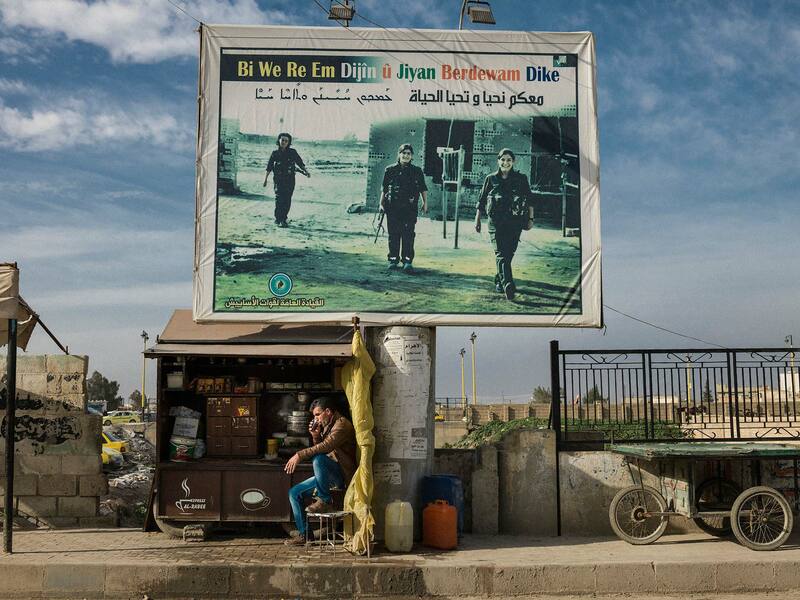 Following the Rojava uprising, thousands of Kurdish men and women enlisted in military units. 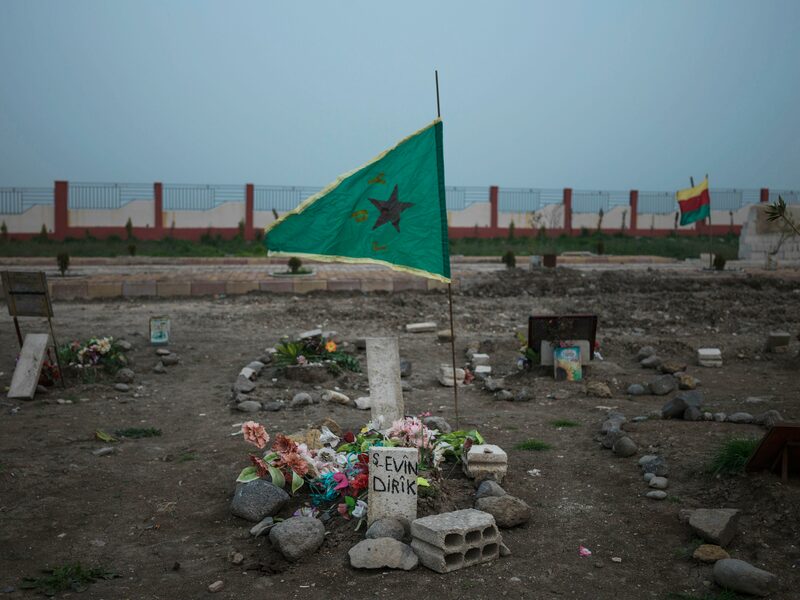 The commanders who trained the new members were veterans of the Kurdistan Workers’ Party – hardened fighters and staunch ideologues that had spent years fighting the Turkish state in their main base on Mount Qandil, in the North of Iraq. Arriving in Syria they brought a radical ideology, which they publicly advertised with the aim of bringing security and stability to Rojava. 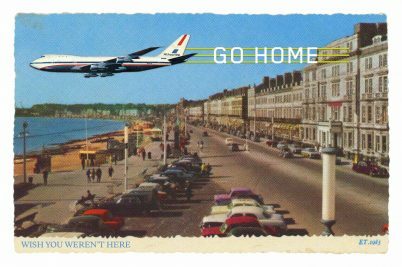 Soon, their membership soared. With the promise of gender equality – giving women the power they had been denied for hundreds of years – Öcalan’s ideas swept female citizens off their feet. The temptation of breaking free from a patriarchal society was so strong that, in a couple of years, rosy-cheeked rural girls developed into warriors so confident in their ways that they were ready to kill or be killed. 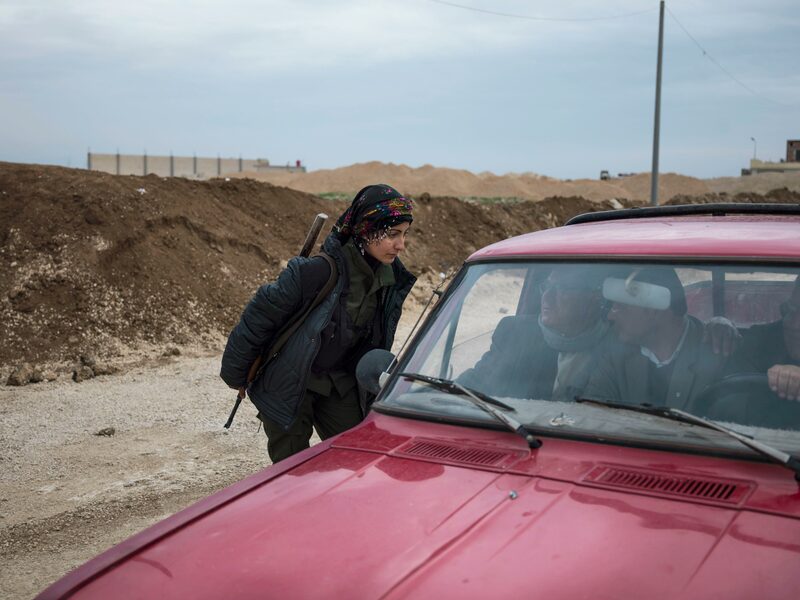 “Our women rush to fight ISIS, cheering with joy, as if they are going to a wedding party,” says Zin, a thirty-one-year-old female fighter, who had lived in Mount Qandil for years before she was transferred to an all-female security base in Derek, a town in northeastern Syria, sandwiched between Turkey and Iraq, that is today under Kurdish control. As she speaks about the attraction of Öcalan’s ideology, cigarette smoke from the ten fighters in the room gets thicker by the second. The walls covered by multiple pictures of martyrs fade beneath the fog. On the rooftops of the houses in Derek town, recently washed clothes dangle on the wires. Among them there is a tiny house, where Cicek used to live. Inside the house, Cicek’s three sisters and her mother sit around her portrait. 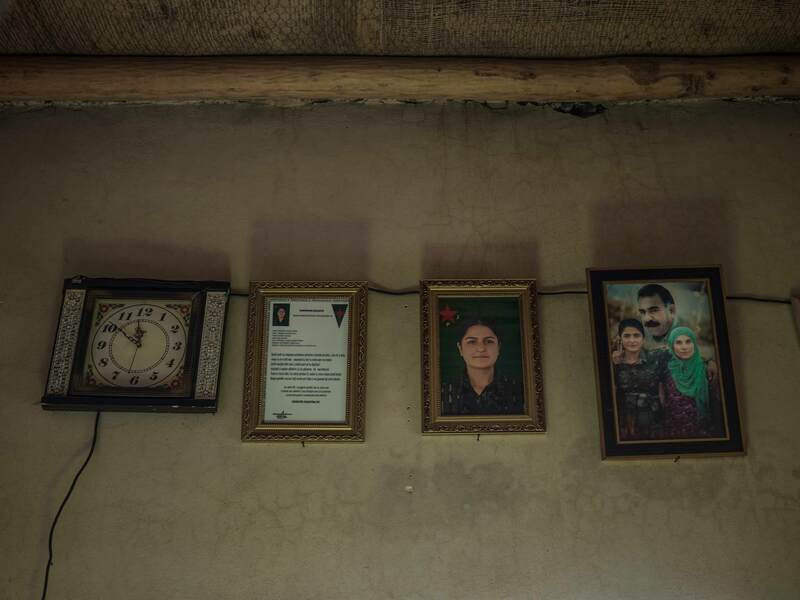 Above them on the wall, hangs a newly framed picture of Cicek and her mother with an inset of Öcalan in the background, along with her martyrdom certificate and a dead clock. A power cut in Derek town casts a sudden darkness. The only lights to be seen are those of passing cars. 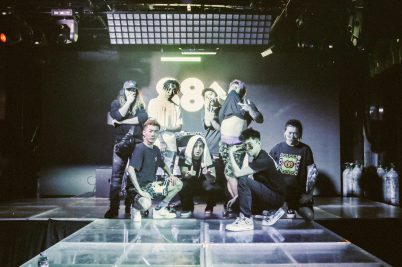 Among them is an old truck that drives by slowly, carrying several megaphones that blast out revolutionary songs, which grab the attention of young boys and girls hanging around the neighbourhood idly. One by one they join the convoy that follows behind the truck. Carrying Öcalan flags, the Institute for PYD Young Revolutionaries in Derek have organised this public call for new members. In a dark corner, away from the gathering crowd, Cicek’s sister stands with a blank stare. She’s listening to young revolutionaries chant along with the songs blasted out on the streets; songs about Kobane and martyrdom that urge survivors to rise and continue the path in which the martyrs’ blood has been shed. At the back of the truck is a mourning caravan, devoted to the memory of the women who have become martyrs after their deaths. 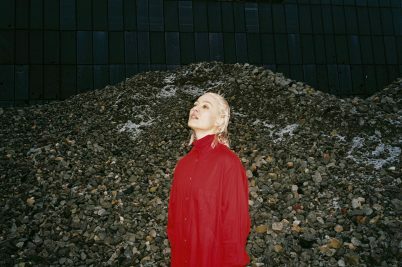 Long after the songs are finished, and everyone else has left, Rojin turns to leave the trailer, lost in deep thought. Find about more about Newsha Tavakolian’s work. 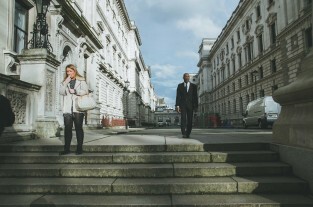 This article originally appeared in Huck 54 – The Defiance Issue.